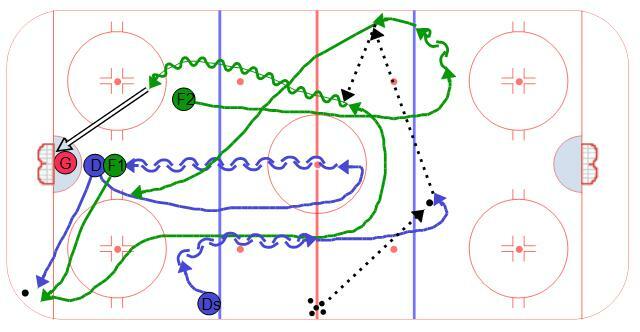 Here is an hockey drill that works on a 1 on 1 down low situation, transition, and a 2 on 1 situation. The drill starts with a forward and defense in front of the net. The other defense starts on the blue line and the other forward starts in the high slot. The drill starts by dumping a puck into the corner. The players in fron of the net battle for the puck. If the forward gains control of the puck they should try and make a play to the net. The player that has the puck needs to protect the puck until the whistle blows. Once the whistle blows the first puck is dead and the coach places a puck into the neutral zone. The defense on the blue line sprints back to the puck and transitions with the two forwards. The forwards then attack the other defense in a 2 on 1 rush. The defense that makes the transition can also jump into the play and make it a 3 on 1 situation.